Take a peek at some of the favorite baby scrapbooking ideas here. Why are baby scrapbooking pages so hot? Simply for the fact that babies are cute. But more for the fact that a baby touches a mommy’s life in very deep and meaningful ways. 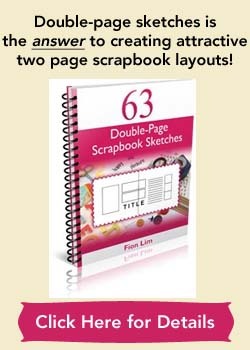 When did many scrapbookers start off their scrapbooking adventure? Since the births of their babies. The excitement of wanting to capture all those so precious moments of a baby’s growth prompted many mommies to be captivated by scrapbooking. You may well be one of those eager and loving moms too. It happened to me too. Just that it isn’t my baby, it’s my sister’s baby. Even so, I can’t resist the temptation to create the perfect gift of love for my baby niece through scrapbooking about her. Ah… remember the first time your poor baby screamed and cried at his first jab? The first time she started crawling awkwardly on all fours? The first time he had his soft, little hair snipped off? The first time she laughed so openly and innocently and just squeezed your heart with love and joy? Babies have so many heart-rendering first moments that etched a lifetime of memories in a mom’s mind. No wonder scrapbooking on a baby’s “firsts” is the among the most popular baby scrapbooking ideas. Even for a beginner scrapbooker, this timeless theme provides an attractive time frame and solid idea to follow through. Many little milestones are celebrated and provide enough enchanting reasons to put down on those baby scrapbooking pages. First-time scrapbookers will suddenly find themselves seized by creativity, and become a shutterbug that just snaps photos away. So baby scrapbooks are easily and naturally filled up with some of the best moments of both baby’s and mommy’s lives. And such scrapbooks are usually arranged in a chronological order, showcasing the order of how your baby has grown in different ways over the months. Babies are often so photogenic and it’ll be tempting for you to take countless photos of your little baby. But only those that speak the loudest for those special moments will make their ways into your scrapbook. So please be selective and put away those that don’t need a space in your baby scrapbooking pages. If not, you’ll find yourself wanting to scrapbook every single piece of photo and you just don’t have all that time. That said, if ever you run into the likelihood of wanting to place great importance on a significant event, a double-page spread will do the job beautifully. And it adds variety to your baby scrapbooking layouts. Alright, did I hear you wanting some help with some baby scrapbooking ideas on a baby’s many little “firsts”? There are many. Here’s a couple of the common ones to get you going on creating more of your own baby scrapbooking ideas. To create a lovely baby scrapbook album is quite easy… you’ll find yourself swamped with tons of help from the many baby-related products and embellishments to be added on as extras. From booties, bibs to milk bottles, all these can become extremely adorable as page accents. The challenge is how to balance the little extras as enhancement and not overload your pages. Babies are as uncomplicated and pure as there can be, so sometimes a clean and simple layout is more than enough. Too many embellishments might overshadow your baby’s glory. So the tip is to simply let your baby’s smiles and priceless expressions shine through the pages. Not forgetting the many pretty memorabilia… keep those precious ones and slip them into your baby scrapbook! How? It’s a great baby scrapbooking idea to add in memorabilia pockets into your scrapbook for inserting your baby’s first lock of hair, the heart-warming well-wishing cards from friends and relatives, your baby’s first-worn bib, and so on. Use your creativity and have fun putting in memorabilia that you think will mean the most to your boy or girl. Another wonderful baby scrapbooking idea is to use a scrapbooking kit. 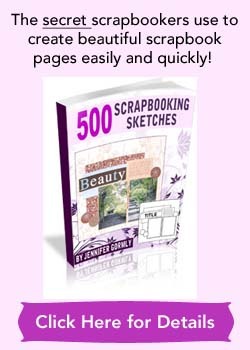 It’s especially helpful if you are a beginner and clueless on how to go about creating beautiful pages. The kit will likely contain enough stuff for you to make attractive baby pages. Kits can be a great time-saver as they are easy to put together, letting you have more time to spend playing with your baby or doing your millions of stuff. There are many kits out there. You can buy one to try it out and see how you like it. There are baby boy kits and baby girl kits. Kits provide you great shortcuts to creating appealing pages that you’ll be proud of. A baby scrapbook album is really a gift to the whole family to enjoy for a lifetime, now and in future. Whenever a page is flipped through, floods of memories will come back, bringing you tears of joys and smiles. For now, here’s some baby scrapbooking supplies for you to browse through.